As we first revealed as long ago as last February Eduardo was locked into a court battle against his ex agent who has been claiming £950.000 as compensation. This represents about 10% of what Arsenal paid to Dinamo Zagreb for Eduardo’s transfer in 2007. According to Eduardo’s ex agent he was unknown as a football player at the start of his career. As a result he signed a contract under which he pledged to pay 10 percent of any future transfers in exchange for management and marketing services. 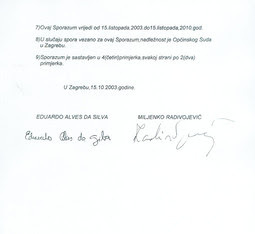 The agent claimed that Eduardo signed an agreement with him in 2003 and produced the document in a Croatia court. Eduardo’s signature appears on this document but Eduardo’s lawyer has claimed that it was either scanned or faked. District Court judge Andrea Krstanovic was apparently left without any option but to ask the advice of an expert to determine the authenticity of the signature. He has now given his evidence in court and the news is good for Eduardo. The signature which appears on the contract is indeed Eduardo’s but it apparently has been placed there not by Eduardo but by the use of a photocopier or laser printer. As we also revealed last week Eduardo recently underwent two surgeries on his ankle (and not one as Arsenal's statement indicated). The first was a revision surgery on the left ankle to remove small metal screws which were originally placed there to assist in his recovery from the horrible injury he sustained more than a year ago. The other however was on the same ankle which apparently has been troubling him since his come back late this season. It was to remove a bone that has been affecting Eduardo’s mobility. Eduardo will follow physiotherapy during June and start pre season with Arsenal on the 5th of July. All the best on a SPEEDY RECOVERY. Dudu!! Why do you insist on this 'two surgeries' nonsense? He had both procedures carried out at the same time in one operation. Who the hell is stupid enough to go to a court with a forged signature? Arsenal: A never-ending vicious circle ‏?